After spending Christmas in Phuket we left on Boxing Day morning, travelling to Phuket town on a local open-sided bus which we weren't sure would ever arrive but eventually did and was quite fun, if a little scary on the downhills. A short walk across Phuket later, we stopped outside the bus station for some very tasty noodles and iced tea before setting off on a long coach journey to Surat Thani, the nearest railway station. We reached Surat Thani (actually Phun Phin, a suburb) with three hours to kill and stumbled across the loveliest market we've seen yet. As Dgym has already mentioned, I ate bugs. I would like to point out that people eat wiggly seafood all over the world, French people eat frogs and snails, Tequila is made from worms and for goodness sake, some people even eat haggis. Eating bugs is not inherently any more gross than eating animals with slightly fewer legs, and is considered perfectly normal in many parts of the world. The mealworms actually looked tasty and I definitely wanted them. Grasshoppers sounded fiddly but kind of prawn-like in composition so I was interested to try some of those. I thought the grubs looked a bit fat and squishy for my tastes but I saw a Thai girl order a big bagful of them and she looked so excited I felt they deserved my attention too. The verdict - mealworms were good, they were crispy and took on the spicy peppery flavouring very nicely. I finished them and would happily eat more. Grasshoppers were OK but too fiddly and not enough edible stuff to be worth the effort. 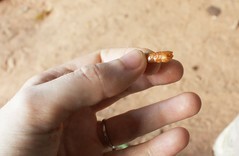 I bit into a grub and spat it out straight away - as I had suspected, too squishy and full of yucky bug stuff. Definitely an acquired taste. We also had some delicious freshly cooked Thai doughnuts (served with the traditional green Thai custard), grilled chicken and sushi from the market, all of which were yummy. 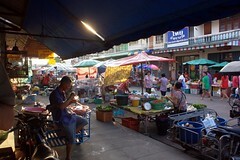 I think I could happily stay in Phun Phin for a week and eat my way through the market. After that we took the sleeper train to Bangkok, we had first class tickets this time - the cabin was a bit cramped but it was infinitely better than the non-reclining seats. 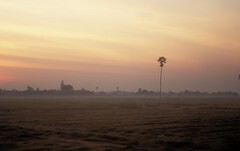 We could have flown but I was glad we travelled overland this time - it took some time but it was worth it for the market and for the gorgeous sunrise which Dgym missed - pink sky and light mist over farmland dotted with tall lollipop-like palm trees. Bangkok seems more familiar than it should do for somewhere we've stayed in for 4 days and passed through a couple of times. There's an odd kind of charm about it that I can't put my finger on, in spite of the heat and the fumes and the traffic. It was nice to come back and kill a few hours in cafes before our flight out of Thailand into Cambodia.